If you have a personal favorite that isn't on this list, please let me know. See you on the other side of Spring Break! Despite the existence of well-established guidelines for clinicians on applying effective smoking cessation interventions in practice, one in five adults in the U.S. continues to smoke. This fact has led researchers to explore other ways to motivate smokers to quit, such as using imaging technology to show them the personal consequences of tobacco use. In a randomized trial recently published in the Archives of Internal Medicine, researchers tested the "pictures are worth a thousand words" theory by comparing cessation rates between smokers who received standard therapy plus carotid plaque ultrasonographic screening to smokers receiving standard therapy alone. The results were uniformly disappointing. Even though 58 percent of smokers in the intervention group were found to have carotid plaques, there was no statistical difference in cessation rates between the groups after one year, and patients with plaques were not more likely to quit smoking than those with normal ultrasound results. 1) To help smokers quit, talking trumps technology. 2) Don't confuse cardiovascular imaging with preventive medicine. Part of the above post was originally published on the AFP Community Blog. Can't get a Supreme Court-side seat for next week's six hours of oral arguments on the constitutionality of the Affordable Care Act? 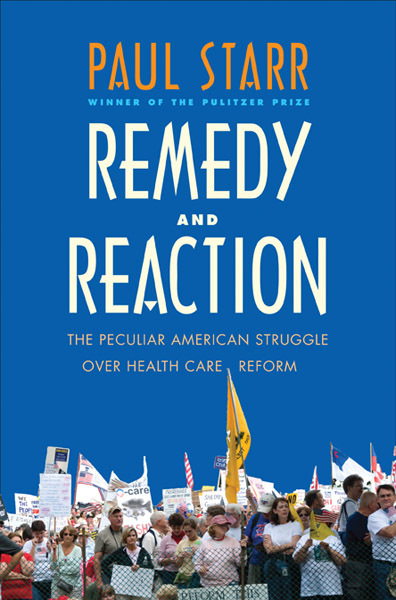 Want to understand how the United States reached the point where the fate of a mostly yet-to-be-implemented 2010 federal law that extends health insurance coverage to nearly all of its citizens may rest on the Justices' interpretations of the Constitution's Commerce and Taxing and Spending clauses? You would do better to spend those six hours reading two essential books that shed a great deal of light on the legislative history and contemporary health policy issues that have shaped the current debate: Paul Starr's Remedy and Reaction and Douglas Kamerow's Dissecting American Health Care. By removing the elderly and much of the working population from the uninsured, Medicare and the tax exclusion also removed much of the impetus for extending coverage to those still lacking it. The direct cost of Medicare and employer-provided coverage of beneficiaries is obvious, supporting the sense that beneficiaries' benefits are earned, while the heavy government subsidies involved are all but invisible. Extending similar benefits to others thus not only threatens a tax increase for those already covered but also can readily be understood or characterized as “welfare” and incompatible with US political ideals. The piecemeal approach to health insurance coverage did little to address problems in health care delivery, but it increased vested interests in maintaining the status quo. Over time, reform proposals tended to leave more and more of the enormously complicated web of health care subsystems in place. One result is the great complexity of the Affordable Care Act, which provides yet another reason for objecting to it. None of the numerous other histories of US health care policy develops these themes in such an illuminating fashion. 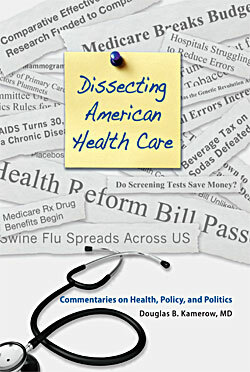 Finally, there are quite a few essays throughout the book commenting or reflecting on recent developments in U.S. health care reform - made all the more interesting by the author's inclusion of essays in which his predictions about the course of health care reform turned out to be incorrect. ... This is a short, portable, and easily readable volume. All the essays are brief, so the book is perfectly suited for keeping on hand for those times when a few minutes are available to sneak in some reading. This book would also be suited to use in teaching on medicine and politics or medicine and society - the essays would provide interesting discussion starters for student or resident discussion groups. Guest Post: PSA screening: does it or doesn't it? Marya Zilberberg, MD, MPH is an independent physician health services researcher with a specific interest in healthcare-associated complications and a broad interest in the state of our healthcare system. She is also a Professor of Epidemiology at the University of Massachusetts, Amherst. The following post was first published on her blog, Healthcare, etc. How can the same test cut prostate cancer deaths and at the same time not save lives? This is counter-intuitive. Yet I hope that a regular reader of this blog is not surprised at all. For the rest of you, here is a clue to the answer: competing risks. What's competing risks? It is a mental model of life and death that states that there are multiple causes competing to claim your life. If you are an obese smoker, you may die of a heart attack or diabetes complications or a cancer, or something altogether different. So, if I put you on a statin and get you to lose weight, but you continue to smoke, I may save you from dying from a heart attack, but not from cancer. One major feature of the competing risks model that confounds the public and students of epidemiology alike is that these risks can actually add up to over 100% for an individual. How is this possible? Well, the person I describe may have (and I am pulling these numbers out of thin air) a 50% risk of dying from a heart attack, 30% from lung cancer, 20% from head and neck cancer, and 30% from complications of diabetes. This adds up to 130%; how can this be? In an imaginary world of risk prediction anything is possible. The point is that he will likely die of one thing, and that is his 100% cause of death. Before I get to translating this to the PSA data, I want to say that I find the second paragraph in the Results section quite problematic. It tells me how many of the PSA tests were positive, how many screenings on average each man underwent, what percentage of those with a positive test underwent a biopsy, and how many of those biopsies turned up cancer. What I cannot tell from this is precisely how many of the men had a false positive test and still had to undergo a biopsy -- the denominators in this paragraph shape-shift from tests to men. The best I can do is estimate: 136,689 screening tests, of which 16.6% (15,856) were positive. Dividing this by 2.27 average tests per subject yields 6,985 men with a positive PSA screen, of whom 6,963 had a biopsy-proven prostate cancer. And here is what's most unsettling: at the cut-off for PSA level of 4.0 or higher, the specificity of this test for cancer is only 60-70%. What this means is that at this cut-off value, a positive PSA would be a false positive (positive test in the absence of disease) 30-40% of the time. But if my calculations are anywhere in the ballpark of correct, the false positive rate in this trial was only 0.3%. This makes me think that either I am reading this paragraph incorrectly, or there is some mistake. I am especially concerned since the PSA cut-off used in the current study was 3.0, which would result in a rise in the sensitivity with a concurrent decrease in specificity and therefore even more false positives. So this is indeed bothersome, but I am willing to write it off to poor reporting of the data. Let's get to mortality. The authors state that the death rates from prostate cancer were 0.39 in the screening group and 0.50 in the control group per 1,000 patient-years. Recall from my meat post that patient-years are roughly a product of the number of subjects observed by the number of years of observation. So, again, to put the numbers in perspective, the absolute risk reduction here for an individual over 10 years is from 0.5% to 0.39%, again microscopic. Nevertheless, the relative risk reduction was a significant 21%. 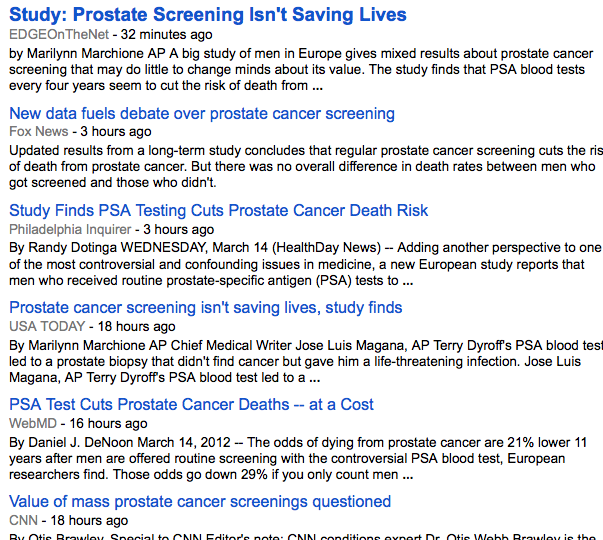 But of course we are only talking about deaths from prostate cancer, not from all other competitors. And this is the crux of the matter: a man in the screening group was just as likely to die as a similar man in the non-screening group, only causes other than prostate cancer were more likely to claim his life. The authors go through the motions of calculating the number needed to invite for screening (NNI) in order to avoid a single prostate cancer death, and it turns out to be 1,055. But really this number is only meaningful if we decide to get into death design in a something like "I don't want to die of this, but that other cause is OK" kind of a choice. And although I don't doubt that there may be takers for such a plan, I am pretty sure that my tax dollars should not pay for it. And thus I cast my vote for "doesn't." I should not have been called to see this patient. Decisions like the one we had to make that day should have been made among friends and family or in the company of his family physician or oncologist, at a time when he was awake and at his best, when he was not in pain, and he could remember who he was and he could explain to those he would leave behind how he wanted to be remembered. To have to make such decisions the way we did that day—counseled by a stranger in the sterile alcove of a busy emergency room—is not what any of us would want. That it turned out the way it did, I believe, was fortunate. It would have been so easy for the powerful momentum of modern medicine to have carried his broken body into the operating room and from there to the ICU, where he would be nurtured by the finest medical technology and the clinical compassion of strangers. Recently, we have been warned that government “death panels” would knock us off. The provision in the new health care legislation, which said that private, end-of-life discussions between a patient and his or her physician would be reimbursable every 5 years, somehow became a sinister governmental strategy to kill us quickly and save resources. It disappeared from the President's health care legislation, was quietly added back as a Medicare provision, but disappeared again when the new Medicare guidelines came out. Can this sensible, thoughtful proposal really be so objectionable? ... Every one of my patients is going to die one day. Like it or not, I should have these conversations earlier, more often, and more comfortably. If that makes me part of a death panel, well, I suppose I can live with that. What's in your doctor's health care shopping cart? 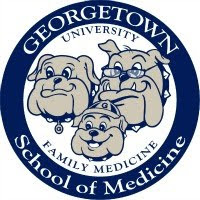 The American Academy of Family Physicians recently partnered with the American Board of Internal Medicine and several other physician and consumer groups in the Choosing Wisely campaign, an initiative to promote more efficient use of limited health care resources. 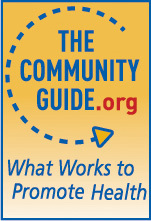 Although this campaign focuses on reducing use of tests or procedures that have no clinical benefits (e.g., imaging for uncomplicated low back pain, antibiotics for upper respiratory infections), it raises the question of whether physicians should take some responsibility for controlling costs of health care beyond simply eliminating "waste." For example, should your physician's virtual "shopping carts" drive more selective use of health services that have high costs and marginal benefits (e.g., coronary CT scans, cancer screening in patients over age 75 years)? Or is this type of thinking unjustified and unethical rationing? What's your view? On the first day of the clinical preventive medicine course that I teach every spring, I review the concept of lead-time bias and its potential to make a screening test look more effective than it really is (or, effective when it's not). 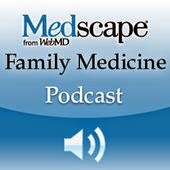 Frugal Family Doctor recently explained how lead-time bias deceptively improves 5-year survival statistics. If you are unfamiliar with this concept, I recommend reading his post, but the basic idea is that by advancing the time in the disease course that cancer (or some other condition) is detected, screening will always increase the percentage of patients who survive for 5 years or more, even if it doesn't do anything to reduce mortality. This concept is as basic to the appropriate use of screening tests as vital signs are to the practice of medicine. In my opinion, any physicians who don't understand lead-time bias ought to have their test-ordering privileges suspended until they do. Unfortunately, a study published today in the Annals of Internal Medicine concluded that a whole lot of clinicians require remedial education regarding lead-time bias. A national sample of more than 400 primary care physicians were provided scenarios about the effects of two hypothetical screening tests. The first test improved 5-year survival from 68 to 99 percent, and the second reduced the mortality rate from 2 deaths per 1000 to 1.6 deaths per 1000. 95 percent of surveyed physicians said that they would "definitely" or "probably" recommend the test that improved 5-year survival, even though this information (which is based on lead-time statistics associated with screening for prostate cancer) provides absolutely no evidence that the test improves patient outcomes. In contrast, considerably fewer physicians were enthusiastic about the test that actually lowered the mortality rate, perhaps because the absolute risk reduction seemed unimpressive by comparison. Another disappointing finding was that almost half of surveyed physicians believed that a screening test "saves lives" if more cancers are detected in screened than in unscreened populations. The truth is, finding more cancers is a poor assurance of better outcomes. For example, a randomized trial of screening for ovarian cancer found no difference in mortality rates between women assigned to annual screening versus those receiving usual care despite 21% more cancers being detected in the screening group. This study confirmed what most medical organizations had suspected for years in recommending against ovarian cancer screening in asymptomatic women. Unfortunately, another survey published recently in Annals found that one-third of a nationally representative sample of family physicians, general internists, and obstetricians nonetheless believe that ovarian cancer screening is effective. The Institute of Medicine has identified low levels of health literacy in the general population as a major obstacle to ensuring optimal health and quality of care. But how can physicians expect our patients to make informed decisions regarding screening tests when large numbers of us are functionally illiterate regarding basic screening concepts? As a medical educator, I took home this message from these studies: medical schools, residency programs, and certifying boards must devote more time and effort to improving physicians' literacy regarding screening, lest misleading survival statistics continue to fuel overuse of ineffective tests and expose countless patients to potential harm. Since I began blogging at Common Sense Family Doctor in July 2009, its posts have been featured in widely read blogs such as KevinMD.com, Care and Cost, The Health Care Blog, and Gary Schwitzer's HealthNewsReview, as well as the websites of major national newspapers such as the New York Times, the Wall Street Journal, USA Today, and the Boston Globe. I also wrote the consumer health blog Healthcare Headaches for U.S. News and World Report from August 2010 through September 2011. A list of selected talks that I've given over the past few years is available here.